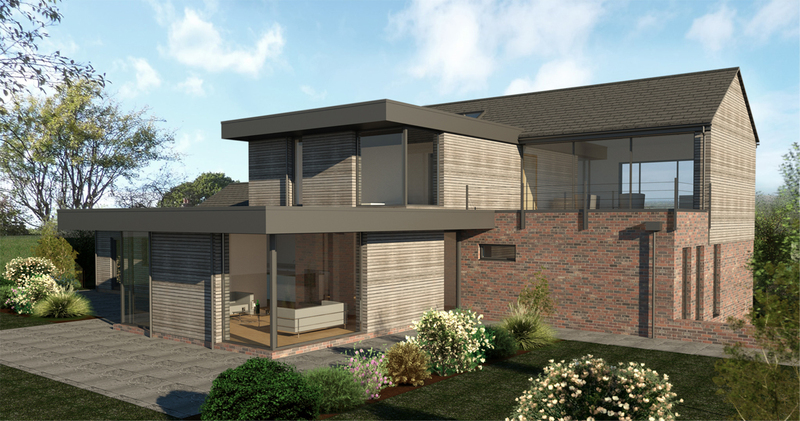 The new house at Sherwood will replace an existing 1930s bungalow, which had a mono-pitched two storey extension to the rear, dating from the 1980s. The site is in an established residential area dating from the early twentieth century, with individual houses comprising a wide range of styles from 1920s-1990s. The site is located on a ridge at the edge of the Peak District, with access to views over the hills to the rear and distant views over Manchester to the front. The living and sleeping spaces are split across both levels of the building, with giving the master bedroom and formal lounge on the first floor, with access to the excellent views. As the house is within Green Belt, the volume and height of the replacement dwelling is restricted by planning policy. The planning authority required the new house The planners wanted to preserve the existing traditional style of it’s the immediate context, refusing consent for a flat roofed scheme. To achieve planning consent, the house had to have a pitched roof, with materials, scale and massing following traditional principles, however, our crisp minimal detailing creates a polite modern insertion in the existing streetscape.